Mobile device security it a priority Android developers and device manufactures. Google and OEMs like Samsung have been working to add as much protection as possible to their devices for years. While extra security is a good thing for all consumers, it has its downsides for us geeks that like to root and customize our devices to our liking. Having root access to your Android device means you can make almost any changes you'd like, even system-level changes which include new custom ROMs (the OS that runs the phone). Back in the early days of Android it used to be trivial to root an Android device, but they’re much more locked down these days. As a consequence of OEMs added a new level of security and more security features like Samsung's KNOX, it has become harder to gain root access to many of the new Android devices such as the Galaxy Note 3 and Galaxy S5. Until recently the AT&T and Verizon versions of the Samsung Galaxy S5 were unable to be rooted prompting XDA members to take up a collection for a bounty on a root method that topped over $18,000. Enter famed developer and noted hacker George “Geohot” Hotz. Geohot has come forward with a working root method that not only roots the Galaxy S5, but it also roots almost every other Android phone currently on the market. 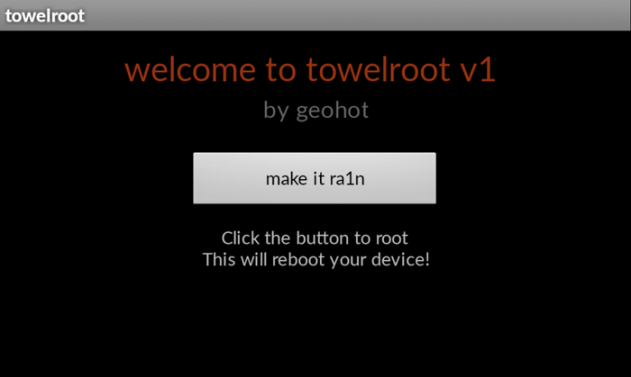 Dubbed Towelroot, the new tool comes in the form of a downloadable APK file that makes rooting your device as easy as allowing your device to install from 'unknown sources', sideloading an APK file and clicking “make it ra1n.” Because this method is easy it should be noted you should only download Towelroot from the official page. That’s also where Geohot is accepting donations for his work via PayPal and Bitcoin. Since the tool differs from all the standard root methods in that it uses an exploit to root phones, it should work on almost all phones running Android 4.4.2 or earlier. That includes all of Samsung’s recent phones like the Note 3, Galaxy S5, and Galaxy S4. All of LG’s newer flagships (G2, G3, G2 Pro, etc.) are susceptible as well. And that’s just the start. If you've ever wanted to try rooting your phone and using a custom ROM it certainly doesn't get any easier than this! Just be aware this tool will probably void your warranty, especially on Samsung devices where it will trip the Knox security flag.